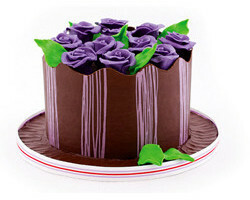 Why not surprise your mother on her birthday or Mother’s Day with this purple striped cake? 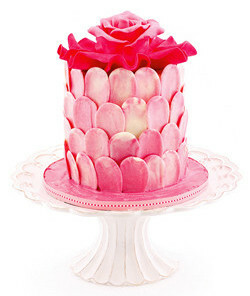 It is quite a feminine cake that any woman would adore. If you do not have time to make chocolate paste roses, just use fresh roses instead. 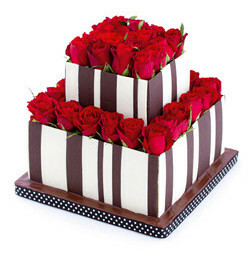 Delicately light, flowery chocolate rose petals decorate this cake. 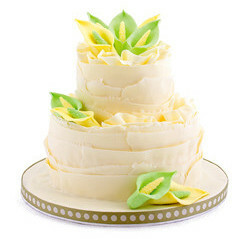 When serving, cut the cake in half horizontally, dividing it into two cakes. Then cut each cake into thin slices and serve with a few petals for each guest. Cigarillos look like small cigars but have the exquisite taste of chocolate. Each person gets a piece of cake with their own chocolates to savour. 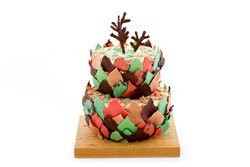 In this download Katrien shows you how to decorate this beautiful cake from start to finish! 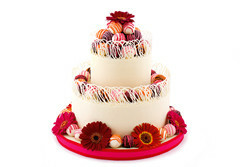 This cake has lots of colourful flowers for a girl’s birthday party or even for a christening. 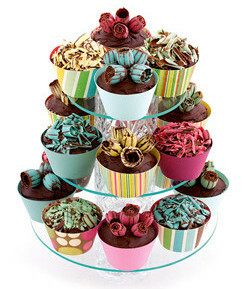 For a thoughtful memento of the party, decorate some cupcakes in the same way to present to each guest to take home. Layers of shaved chocolate look almost like flaky pastry. 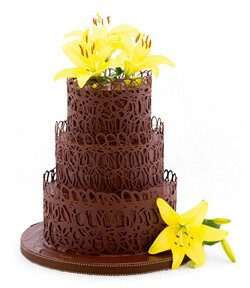 The chocolate paste arum lilies round off this cake suitably for a wedding. 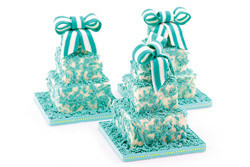 This delicately light lace design works well for a feminine birthday cake, a bridal shower or even a wedding cake. 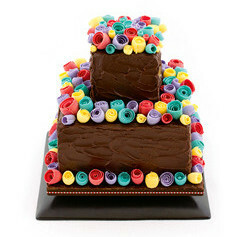 Everybody loves cupcakes, the perfectly-sized individual cakes for a celebration. You can make them for a child’s birthday party or an adult’s alike. 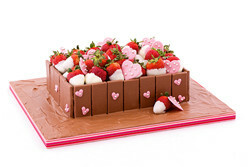 Give a lovely chocolate cake gift box decorated with chocolate hearts. and topped with chocolate- dipped berries. It is sure to be a heartfelt gift for anyone, especially on Valentine’s Day. 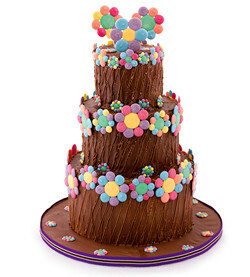 The plain chocolate icing sets off the brightly coloured chocolate scoops beautifully; this birthday cake will be a hit at any age! 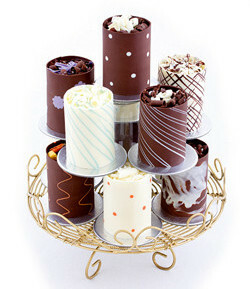 These dainty little cakes with their decorative chocolate collars are large enough to share, although you won’t want to! This elegant cake combines old lace with a modern straight collar and will be ideal for a wedding. Any gardener will love this cake. Make the leaves in white and green. 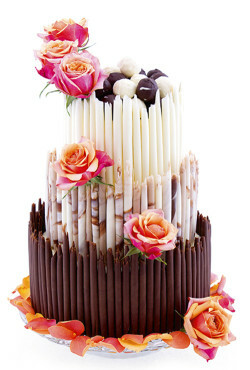 chocolate for a spring-fresh look or create an autumn look with orange, yellow and red leaves. 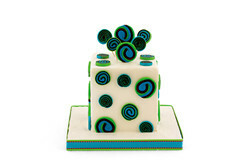 This retro-inspired cake would be ideal for a modern wedding. 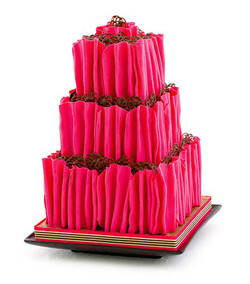 This cake makes a fashion statement with its pleated fabric look! Polka dots are lots of fun. This cake can be made for any gender and is especially popular for 21st birthdays and anniversaries. 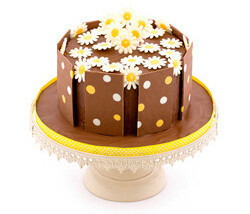 Dress it up even more by adding chocolate daisies. 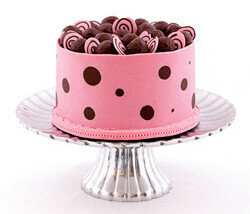 Pink and polka dots remind you of a baby girl; bake this cake with its modern twist for a baby shower or christening. Colour the chocolate blue for a baby boy. 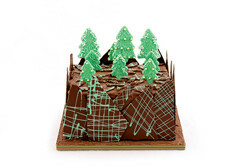 This easy-to-make Christmas cake is a good alternative to a traditional. cake, especially if the chocolate fruitcake recipe is used. It will make a lasting impression on your family and friends. 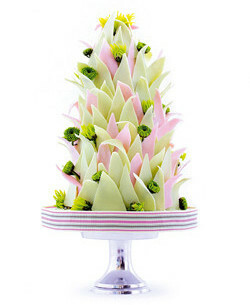 Small, individual cakes adorned with shavings and prettily striped bows are ideal for a small dinner or birthday party. These three make lovely centrepieces. The sharp and curly edges of these spiky triangles are quite modern Makes up to 20 servings. and funky! 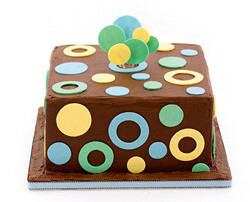 Crisply neat dots do the polka on this festive cake. This is an easy cake for a beginner to make: it looks impressive but is fairly quick to make. When serving, cut this cake in half horizontally so that you have two cakes and then cut each cake into squares. 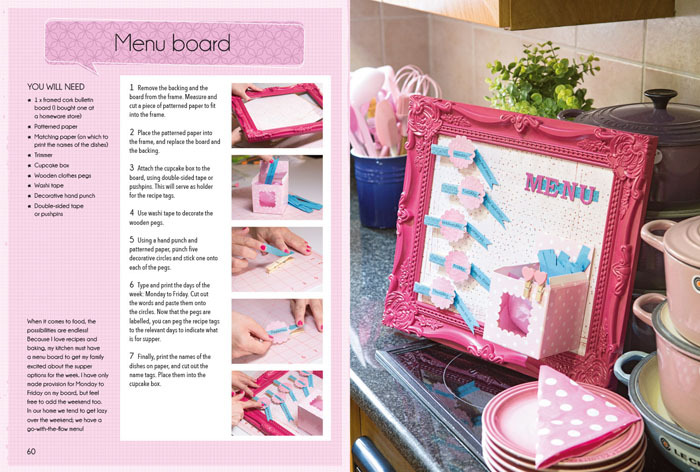 This download includes everything you need to know before you start any one of Katrien's cake decorating projects. If you are a beginner, it is a must! If you already know your way around the cake-decorating kitchen, you can skip this one. 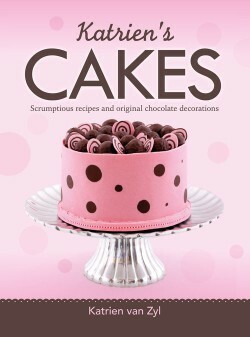 The download covers everything from equipment and working with chocolate, to filling and coating cakes. 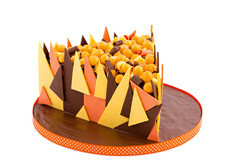 The hard and sharp edges of these triangles make this a masculine birthday cake for a boy or man. Truffles galore! 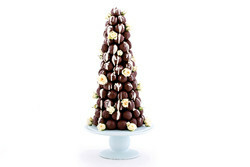 A tower of truffles is a highly impressive dessert and deli-cious treat at a party. Guests will delight in picking off their own truffles from the tower.